The item Ant-Man, vol. 1 : second chance man, Issue 1-5, writer: Nick Spencer ; artist: Ramon Rosanas ; colorist, Jordan Boyd ; letterer: VC's Travis Lanham ; cover art: Mark Brooks ; editor: Wil Moss, (electronic resource) represents a specific, individual, material embodiment of a distinct intellectual or artistic creation found in Lawrence Public Library. 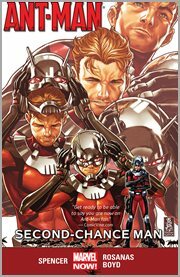 Scott Lang has never exactly been the world's best super hero. Heck, most people don't even think he's been the best Ant-Man! And the last guy invented Ultron and joined the Masters of Evil, so that's saying something. But when Iron Man calls with a once-in-a-lifetime opportunity, Scott's going to get a second chance to be the hero he's always dreamed of becoming! Then, Scott faces off against his old foe the Taskmaster, but who is the mystery villain pulling the strings? And when Ant-Man needs to pull off an impossible break-in, he assembles a new gang...of criminals! Because that's what heroes do, I guess. Sure, he's been to prison, had a messy divorce and was...um, dead for a while there. But this time is different! This time nothing is gonna stop the astonishing Ant-Man!